To say we are enjoying fresh cranberries this season is an understatement...they're going in everything over here...even popped a few into the roasted sweet potatoes and brussels sprouts on Thanksgiving. YUM. And they've made their way into my soda water...while my kids pop them in their mouths like grapes. It's a little tart, okay a lot tart, but it's become a game, and one we like. heh heh heh. Then there's this cake. Mercy. It's just the thing you need to beat the post Thanksgiving day blues. And it's been gray in North Texas, let me tell you. The weather has been cool (cold) and a bit dreary. And my kids have been sick. and teething. And yada, yada, yada. I'm going to eat this cake as soon as it comes out of the oven and then I'm going to get through the day to day chores and then I am going out alone tonight. To buy shoes. For myself. By myself. Anyway, let's get started. This bundt cake shouldn't wait any longer. Place cranberries and lime halves on parchment lined baking sheet. Roast for 12 minutes. Remove from oven and allow to cool. In a medium sized mixing bowl mix together the flour, salt, baking soda and 2 tablespoons lime zest. Set aside. In the bowl of a stand mixer beat butter and sugar for 4-5 minutes. Turn mixer to low and add eggs one at a time and then add the lime juice (from the roasted lime). Now add the flour mixture and sour cream, alternating and beginning and ending with flour mixture. Once combined, place half of the batter into the bundt pan and then sprinkle with 3/4 of the roasted cranberries (reserving the remaining 1/4 cup for topping) and remaining lime zest. Add the rest of the batter and smooth with spatula. Bake at 350f for 55-60 minutes. Until golden brown and until a toothpick inserted into center of cake comes out clean. Allow to cool in pan for 20 minutes and then flip onto a cooling wrack and allow to cool completely. While cake cools you can mix together the glaze. In a small bowl mix together the powdered sugar, lime juice and zest with a fork. Add milk one tablespoon at a time. You may need more than 2 tablespoons, depending on how thick you'd like your glaze. We like it to be smooth and pourable. Once cake has cooled coat entire cake with glaze, using a pastry brush. 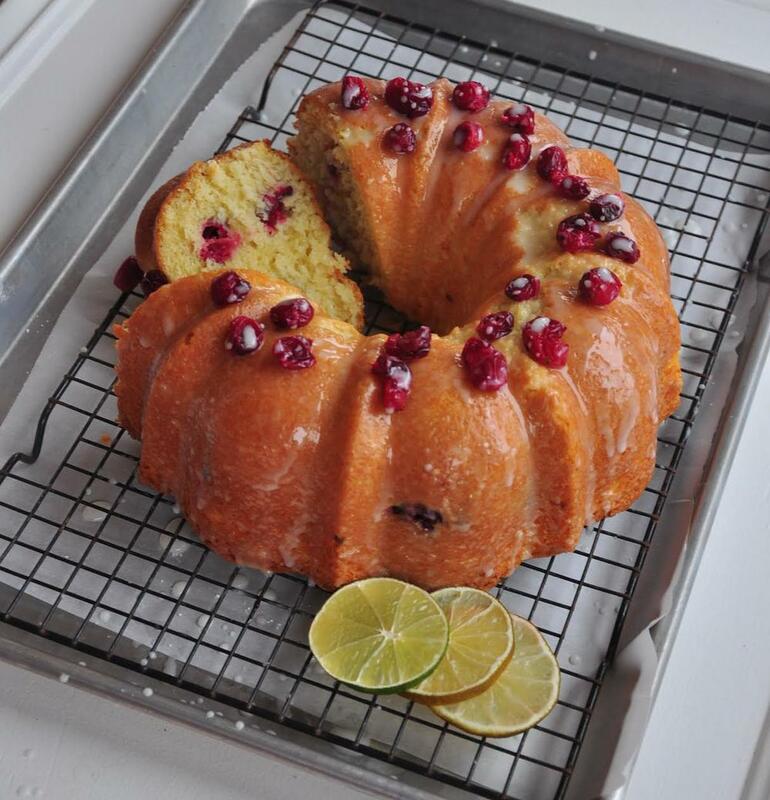 After a few minutes add the reserved 1/4 cup cranberries to top of cake and drizzle with remaining glaze. I usually use a fork to do this.